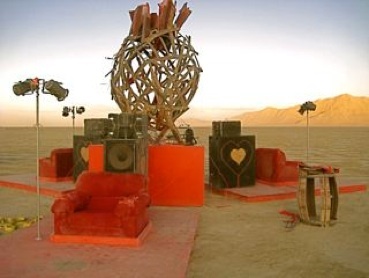 The Heartbeat Amplifier at Burning Man artistic effort was a festival project involving a collaboration between Alan Macy and Hitch McDermid with the support of dozens of volunteers. In June 2009, on a cold night in Michigan, Hitch had a vision to amplify the sound of the human heart through bass heavy speakers. Soon thereafter, Dr. Mike North, a mutual friend introduced Hitch to Alan Macy, a biomedical scientist and artist with a similar dream. Alan suggested the use of the electrocardiogram (ECG) signal as the source for Hitch’s Burning Man art project. Within a few weeks, Alan developed an ECG amplifier and light driver. Soon thereafter, Hitch and Alan undertook some experiments in Fishbon’s Pescadrome studio in Santa Barbara. Naturally, as prototype development progressed, with Randolf Crowson’s and Jeffrey Boynton’s attendance too, the ideas started coming. What began as a wish to simply amplify the heartbeat, soon morphed into the understanding that amplified sound did not have to be the stopping point. Other sensory aspects could be included and so the sensations of touch, light and heat were incorporated. With great excitement, Alan, Hitch, Jeffrey and Randolf began amplifying their own heartbeats in real-time, shaking the rafters with sound, reverberating their bodies with subsonic haptics and lighting up the room with the pulse of their hearts. With Alan’s technical expertise and Hitch’s team-building leadership, they became art project collaborators. 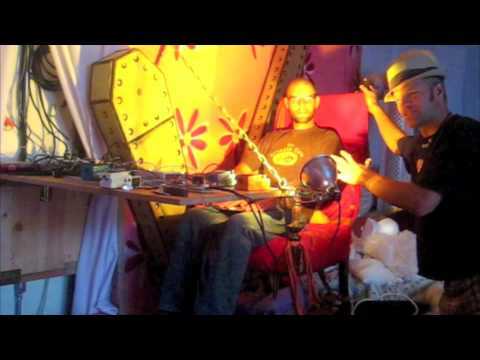 Hitch put together a team of 35 volunteers to build the art and infrastructure of what became the Heartbeat Amplifier at Burning Man, 2009. Festival efforts from Lightning in a Bottle 2010, and later, involved the use of the 2nd Generation Heartbeat Amplifier. As a spectator at Burning Man – one observed multiple participants, sitting in comfortable chairs, seeming very relaxed. However, there was an orchestra of sound and light happening all around the participants. The environment changed as people came and went from the chairs. Multiple participants created a constantly mutating art experience. The experience for participants and spectators was beautiful, mysterious and surreal. Mike North: Without whose magical abilities this project would never have happened. Mark Goerner: Mark Goerner joined the collaborative festival project as the lead structure designer for Lightning in a Bottle (LIB) 2011. Aaron Cutchin: Capable and steadfast, always provides critical support in a pinch. Steve Silverman: The big rabbit, whose photographic skill has captured essential moments. These are entries from the “Heartbeat Diary”, where people wrote about their experiences having their heartbeats amplified by the Heartbeat Amplifier (2nd Generation). “Beautiful to say hello to my heart. My insides. 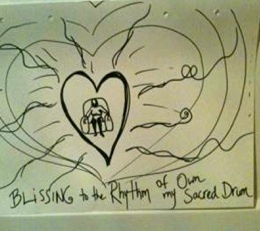 Such a gift!” ~ Bamy G.